On the eve of it’s release, the media frenzy surrounding the release of the film Straight Outta Compton is reaching near Marvel-movie levels, with almost every major media outlet running coverage of some kind. 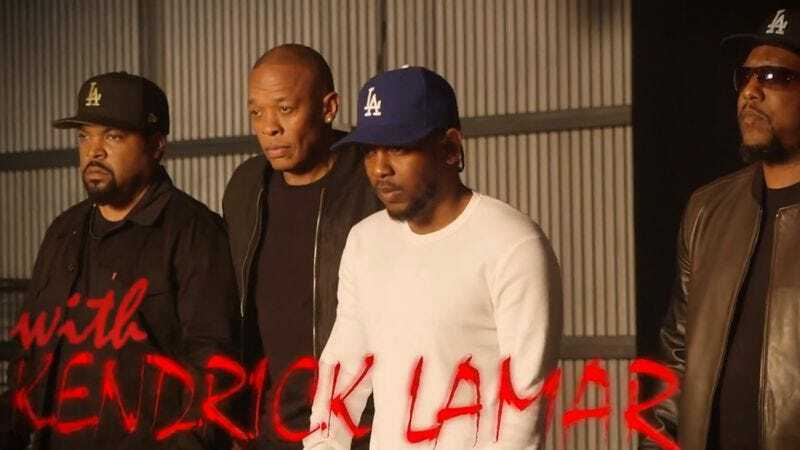 Perhaps looking to stand out among the pack, Billboard Magazine enlisted one of the hottest rappers in the world, Kendrick Lamar, a Compton native himself and one of N.W.A producer Dr. Dre’s more notable disciples, to interview the living members of the outfit for a cover feature. While the story itself is fascinating and adds an extra dimension of context and exposition to the chat, the real gold mine is the nearly 30-minute video accompanying the profile, featuring Lamar sitting down with Dre, Ice Cube, DJ Yella, and MC Ren, and engaging the four legends in conversation. It’s clear right off the bat that Lamar is humbled to be in the room and maybe a little uncomfortable with his role as an interviewer (despite his experience lobbing questions at Tupac Shakur on the To Pimp a Butterfly closing track “Mortal Man”). But as the talk progresses, he eases up and adopts an endearing student/teacher relation to them.